ASTM A403 UnEqual tee, stainless steel UnEqual Tee Manufacturer, stainless steel UnCrosses ss equal tees Manufacturers. owing to their compliance to industry defined standards. 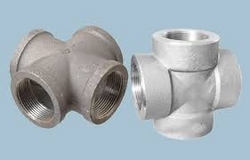 Monel, Nickel, Inconel, Hastalloy, Copper, Brass, Bronze, Titanium UnEqual Tees & Crosses Manufacturers.